Berlin: German chancellor Angela Merkel faces a battle for her political survival on Thursday when some of her coalition, worried about throwing good money after bad by bailing out Greece, could humiliate her in a parliament vote on euro-zone rescue schemes. Merkel’s Christian Democrats Union (CDU) and their allies were pressuring the handful of dissidents to get in line before the vote at 11 am. It should be clear about half an hour after that the EFSF has been passed, but word on how many government lawmakers rebelled could take another hour. 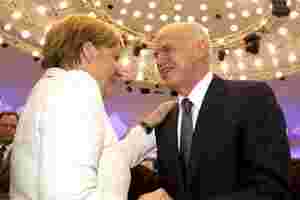 “We are working to convince people," CDU second-in-command, Hermann Groehe, told the news agency. He said “it will be close" but the government would not put itself in the humiliating position of depending on the Social Democrats Party (SPD) and Greens. Merkel tried to assure her coalition that German taxpayers’ money would not be wasted by voting a new bailout for Athens - but she could not rule out that the money might be written off if, as financial markets increasingly fear, Greece defaults. With Germany shouldering up to €211 billion of the EFSF guarantees, critics fear the fund will not be enough and taxpayers will be asked for more. That impression was reinforced by talk at the International Monetary Fund (IMF) last weekend of the need to beef up the EFSF even more - on top of the extra powers decided by European leaders in July - by leveraging its capital and bring forward the permanent scheme supposed to replace it in mid-2013. German finance minister Wolfgang Schaeuble denied just hours before the vote that he had used “that word" - leverage - and said in a radio interview “we have to stick to what the German Bundestag (lower house of parliament) decides". Merkel often is accused, in Europe and at home, of dithering on the euro crisis and if she does not win the EFSF vote on her own terms, it would damage her hopes of taking the conservative bloc she has led for 11 years into the next elections in 2013.
International auditors return to Athens on Thursday to deliver their verdict on whether Greece’s tougher austerity measures quality for further aid. The chancellor has told Greece she wants to wait for the results of an audit by the “troika" of the European Union (EU), European Central Bank and IMF to see whether its findings “tell us we will have to renegotiate or not". Such talk by Merkel and other German officials may refer to raising the level of private creditor involvement in the Greek bailout, by getting them to accept bigger potential losses - or “haircuts" - on their Greek sovereign bond investments. Senior coalition figures like economy minister Philipp Roesler, head of Merkel’s Free Democrat Party (FDP) partners, have already said an “orderly" Greek default should not be taboo. With a core of naysayers in the CDU, its Bavarian allies the CSU and the FDP, the vote will be scrutinized to see how close she gets to a convincing 311 ‘yes’ votes from her own bloc in the 620-seat Bundestag. If there are more than 19 rebels, Merkel will have passed the EFSF thanks to the centre-left opposition and may have to rethink how to address growing discontent among her supporters and the population at large about the euro zone debt crisis. Sentiment remains passionately divided in Germany. Even though labor unions called on MPs to back the measure, the conservatives’ “Mittelstands und Wirtschaftsvereinigung" (MIT) (small business alliance) urged MPs to vote ‘no’ on Thursday. In a statement, the MIT said, “In respect for the free decision of every MP" it expresses its solidarity for the rebels in Merkel’s coalition. “It is personally a difficult decision but politically the correct one," the statement said. With the FDP’s popularity sliding to just 2% in some recent polls and state elections, and the party increasingly critical of euro zone bailouts, it often appears more of a liability than an asset for Merkel. “In the end, the chancellor will have to decide: either she wants to rescue the euro or the FDP," said former SPD foreign minister Frank-Walter Steinmeier of the SPD to Bild newspaper.